Get Instant Pricing in Two Steps! 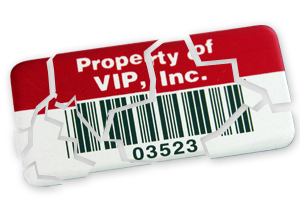 Our Destructible Vinyl Labels are designed to secure assets and fragment once someone attempts to remove the label. Tamper evident security labels that cannot be removed without being destroyed, preventing their re-use. These asset labels are highly customizable and can include custom text, barcode or tracking number to fit your specific needs. Any barcode symbology may be used, but labels can also be produced with no barcode and with human readable data only. Labels are .002" vinyl with a premium acrylic adhesive, which ensures that label aggressively adheres to the asset, until attempted removal. These labels are ideal for situations where label transfer must be avoided. Depending on the layout you selected, you can add up to 5 lines of text. Email a proof for your approval? Worldwide Identification Industry Leader for over 25 years.